We’d like to wish you all a very happy new year, and we hope that 2011 brings you much success and happiness. PCA is a really useful QC tool. It helps you verify that your replicates group as you would expect from your experimental design and highlights any runs that lie outside the expected groupings so you can investigate them further. This can save a lot of time before you get further into your analysis and in some cases shows you may have grouped your replicates incorrectly at the data capture stage. The quantify-then-identify approach we use in Progenesis LC-MS means you can find significant peaks where there is no MS/MS and measure important changes without the need for a peptide identification to be present. 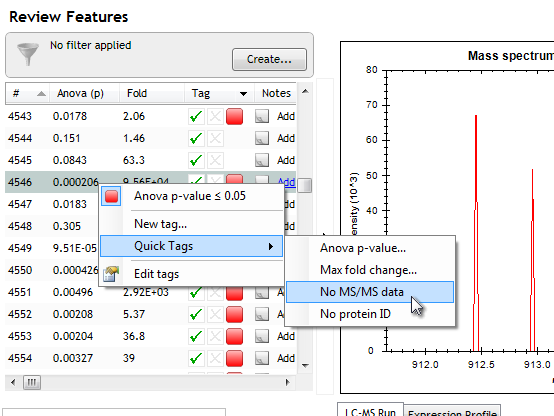 The recent Quick Tags function includes some new default tags to help you quickly build inclusion lists where an MS/MS scan has not been triggered or peptide identification has not been successful. 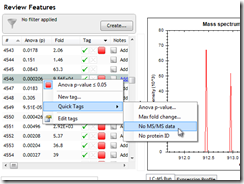 You can select all features that don’t have MS/MS data associated with them, or those without protein IDs, by simply right-clicking on the data table. Inclusion lists can then be generated and used to target peptides of interest for MS/MS when you re-run your sample. Applying this workflow means you can increase your protein and proteome coverage in a highly selective way. I’m sure you are keen to take a look at some of these changes. Progenesis LC-MS v3.1 is available to download from our website and you can get started by working through the online tutorial. We are really excited by our development plans for 2011. We hope that you keep following this blog as it is the best place to keep in touch with all that’s new, and also find out more about interesting applications using the Progenesis range. This entry was written by Beth McArdle, posted on January 10, 2011 at 11:39 am, filed under January 2011 and tagged Progenesis LC-MS. Bookmark the permalink. Follow any comments here with the RSS feed for this post. Post a comment or leave a trackback: Trackback URL.